Pull the handle to open the console compartment. To use the console lid as an armrest, slide it to the desired position while pulling up the release lever. You can keep beverage bottles and cans cool with the air conditioning system. 1. 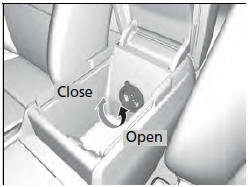 Turn the dial counterclockwise to open the air vent in the console compartment. 2. Turn on the climate control system and adjust the temperature to cool. 3. Set the mode control or . - The cool air is diverted through the air vent. Use only resealable containers or keep unopened cans in the console compartment. Spilled liquids can damage the upholstery and electrical components in the console compartment. 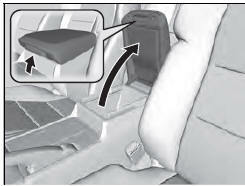 When the heater begins to divert warm air, the airflow into the console compartment is shut off.